I sometimes like to picture Taylor Swift as a screamo singer from 2003. She likely had her Myspace Top 8 filled with bands or other teenaged girls with overexposed profile pictures. Her favorite song started playing right when the page loaded and there were probably all sorts of bells and whistles added because, you know, Myspace. 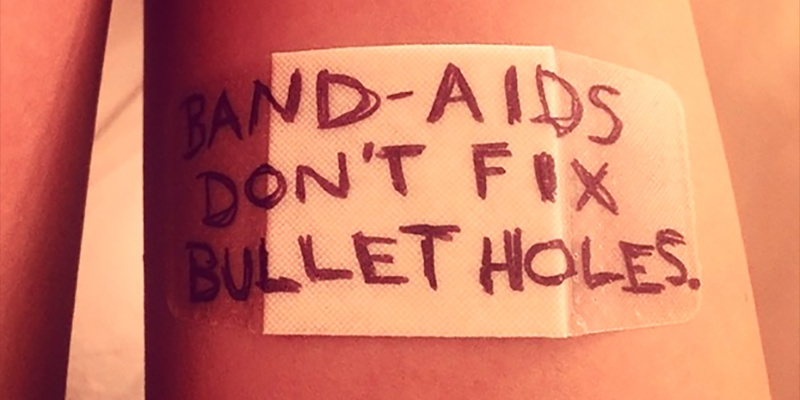 Bandaids don’t fix bullet holes. I started thinking of all the times I’ve tried to fix a bullet hole by putting a bandaid over it. Like the time a baseball coach called me lazy. Or when that parent yelled at me because he thought I treated his son wrong on a mission trip. Or how I felt left behind when all my friends left to go on a great God adventure. The easy thing to do was shrug it off and move on – to put a bandaid on a bullet hole. The problem is a bandaid and some Neosporin can’t heal a gunshot wound. A bandaid and some Neosporin can’t heal a gunshot wound. To this day, I still wonder why God didn’t allow me to move with my friends to plant a church that I’ve fallen in love with. There are other thoughts that still hurt when they come bursting into my brain while I’m driving down the road or in the shower. Instead of processing the pain and healing from it, I’ve tried to cover it up until it’s scabbed over enough to forget about. God never intended us to hold onto the hurt we encounter. He didn’t design us to be people who walked with bullet holes all throughout our body. And yet that’s exactly what we do. We live with pain and hurt buried deep inside us. Whether it was out of embarrassment or pride, we didn’t want to go to someone else to help us heal when we were shot. We didn’t want to make a big deal about our pain so we covered it up and hoped it would go away. The thing about bullet wounds is they usually take surgery to heal. They take someone else digging around at the center of the wound to clean it out and stitch it back up. We’ve been covering up bullet holes with bandaids to look like we have it all together. Then we’ve wondered why our lives never seem to get any better. We’ve been covering up bullet holes with bandaids to look like we have it all together. How have you been covering bullet holes with bandaids? What’s the gunshot you’re still recovering from? Who can help perform surgery? You’ve been holding onto the pain long enough. It’s time for you to heal.